The Wisconsin Humane Society was founded in 1879 in Milwaukee, but its history dates back to 1866 in New York City to a man named Henry Bergh. A world traveler, Bergh was troubled by the cruelty he saw toward animals in Moscow, London and New York City. He attempted to correct the mistreatment of wagon horses — earning him the title “The Great Meddler” — and soon realized the task was too big for him alone. On April 10, 1866, he gathered a group of like-minded individuals in New York City and founded the American Society for Prevention of Cruelty to Animals (ASPCA), the first humane organization in the U.S.
Bergh’s actions inspired similar organizations to form in neighboring states. In 1879, the humane movement reached Milwaukee when the Fortnightly Club — a prominent group of Milwaukee citizens who gathered twice a month to listen to guest speakers lecture on current interests — heard about what was going on out east and invited George Angell, founder of the Massachusetts Society for the Prevention of Cruelty, to come speak. Recognizing that the cruelty Bergh and Angell witnessed in their cities also existed in Milwaukee, members of the Fortnightly Club and other Milwaukeeans created their own humane society just a few weeks after Angell’s talk. The Wisconsin Humane Society (WHS) was officially founded on Dec. 5, 1879. Several historical Milwaukee leaders were significantly involved in the society’s founding, including banker Samuel Marshall and Captain Frederick Pabst. Marshall was the society’s first treasurer and his legacy began the fund that paid for a new building for WHS in 1926. Pabst, who wouldn’t tolerate drivers who were cruel to the horses that pulled his beer wagons and kept a well-maintained stable in Wauwatosa, provided funds that made it possible to lift injured horses onto a WHS horse ambulance. 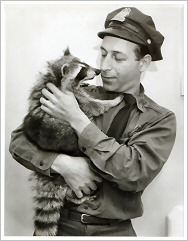 Like many humane societies at the time, WHS’s original mission was to protect both animals and human beings. But as new charitable organizations were founded for children and adults, and social work developed as a profession, humane societies turned to exclusively focusing on preventing cruelty to animals. Today, WHS is the largest humane society in Wisconsin and operates shelters in Milwaukee, Ozaukee, Racine, Brown, and Door Counties, as well as the Spay/Neuter Clinic in West Allis. The Milwaukee Campus is home to the largest Wildlife Rehabilitation Center in the state, as well. At that location, you’ll also find the only known statue of Bergh, standing with an injured dog, which was commissioned by WHS in 1891. For more information on WHS’s extensive history, click here for a pdf version of a centennial book published in 1979, or contact aspeed@wihumane.org to have one emailed to you.